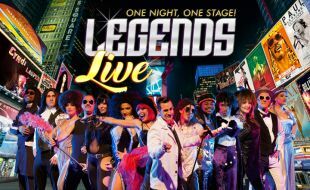 Silverstar Casino | Legends Live - One Night, One Stage! The show kicks off with a medley made in rock and roll heaven – the cast pay tribute to Little Richard, Jerry Lee Lewis, Elvis Presley and Ray Charles – as well as divas, Shirley Bassey, Nina Simone, Cher, Gloria Gaynor and Lulu. Highlights of the show include a heart-rending version of That’s What Friends Are For – paying tribute to Stevie Wonder, Dionne Warwick and Elton John, as well as Piano Man by Billy Joel and Hey Jude by Paul McCartney. The show pays tribute to the amazing vocals of Meat Loaf with songs including, I’D Do Anything for Love and Bat Out of Hell as well as Michael Jackson with Bad, Billie Jean and Beat It. Other highlights include tributes to Tina Turner, Freddie Mercury, Diana Ross, Cyndi Lauper and Billy Idol. Legends Live is an uplifting experience, so book yourself a ticket to the most entertaining, mind-blowing celebration of the music icons that have rocked our world.